Good Feet Orthopedic Arch Supports are worn by, approved by, and recommended by chiropractors, podiatrist and other doctors. Good Feet Arch Supports fit well in shoes, boots, and high heels. Fibromyalgia (fi-bro-my-AL-ja) syndrome (FMS) produces chronic body-wide pain, which migrates and can be felt from head to toe. Other symptoms include persistent fatigue, headaches, cognitive or memory impairment, morning stiffness and non-restorative sleep. The pain can migrate from day to day. Recent scientific research studies have shown central nervous system involvement in FMS. The National Fibromyalgia Research Association is THE source for what�s new in fibromyalgia research and education. 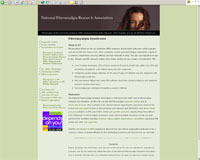 On this site you will find fibromyalgia diagnostic criteria and an Informational Guide. Also available is the newest material regarding the connection between the central nervous system (Chiari & cervical spinal cord stenosis) and FM/CFIDS. Look at low blood pressure problems in FMS and CFIDS.